Even though it chips my polish I still can't seem to pull my heart away from how sparkly, and glam it makes my nails look. Their are 5 of these glitter luxeffects top coats. Shines of times which is a iridescent fine glitter. As good as it gets is again more fine gold glitter. Almost looks yellow in the bottle but haven't swatched it. Overall these are perfect for the holidays! They are the same price a regular priced essie polish about $8. 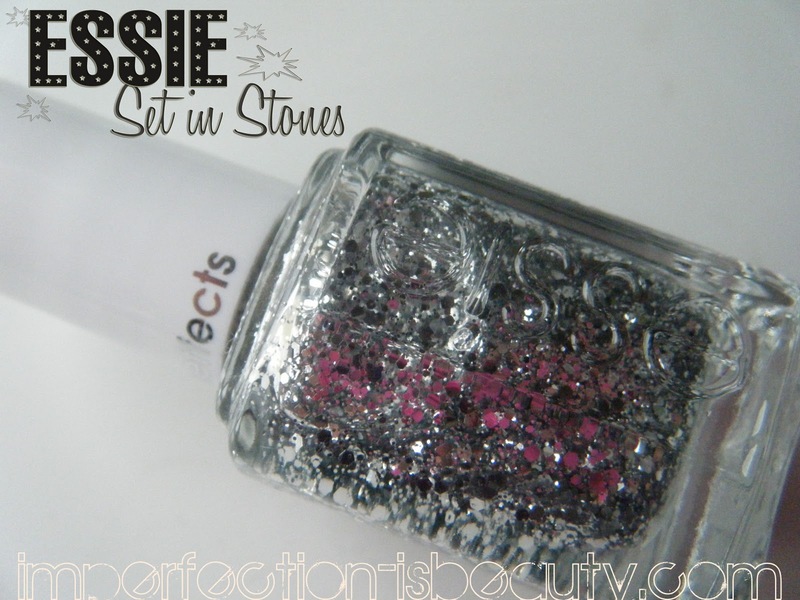 I was very excited when I seen these because essie is one of my favorite nail polish brands. I would say the finer glitters would probably be a better pick because these ones will little less likely chip, and/or catch on things. I do love the way the silver glitter top coat looks, and I think it would look really pretty on just about any color. Before I put it away for a while I do want to add it to a red polish for a really glam festive holiday look. I wouldn't use this as my everyday top coat but its definitley nice to have and really pretty to look at. I did apply this color over essies licorice fora more edgy look. Have you tried any of these luxeffects? you have the most amazing nail polish ideas! now i have to have this! Thanks for the giveaway! I postedbmy entry on YT!!! love it! !its gorgeous for holidays!! I bought one of these I'll have to go home and look at the color and I was not a fan!! I love this nail polish, but how do you take it off?